Proprietary Name: Medichoice Povidone-iodine Prep Pad What is the Proprietary Name? 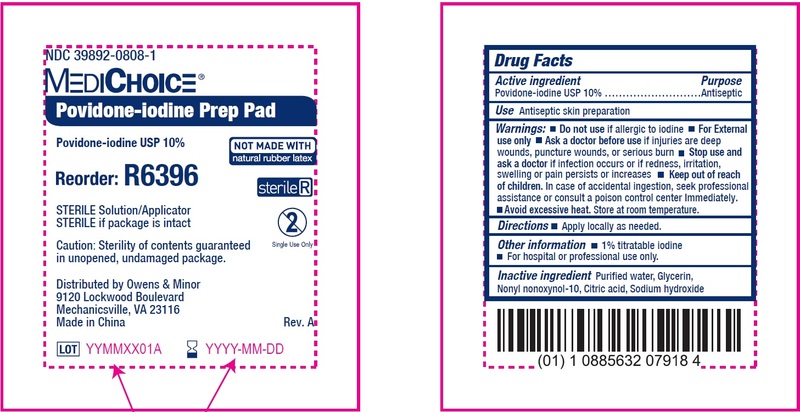 Medichoice Povidone-iodine Prep Pad with NDC 39892-0808 is a a human over the counter drug product labeled by Owens & Minor Distribution, Inc.. The generic name of Medichoice Povidone-iodine Prep Pad is povidone-iodine. The product's dosage form is cloth and is administered via topical form. In case of accidental ingestion, seek professional assistance or consult a poison control center ImmediatelyAvoid excessive heat. Store at room temperature. 1% titratable iodineFor hospital or professional use only.